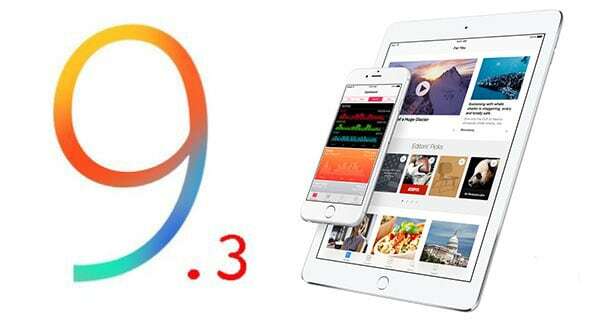 Apple has released a new iOs 9.3.3 beta version for developer testing on iPhone, iPad, and iPod touch. The update is about 1.4GB and is available over-the-air for devices registered to test pre-release versions of iOS. It is a fourth beta released of iOS 9.3.2 to developers. The latest beta update of iOS can now be downloaded from Apple’s Development Centre for testing on iPhones, iPads and iPod touch. The beta releases is still not available for the 9.7-inch iPad Pro because Apple hasn’t yet fixed a bug in iOS 9.3.2 that bricked those devices after updating. The bug can get your iPad Pro stuck in the endless cycle of reboot i.e ‘Error 56″. People who want to join Apple’s Beta Software Program can sign up at the program’s page. To enroll in the beta program you only need your Apple ID, and the program will allow you to access all the beta release of iOS as well as Mac OS. But before installing any beta product be sure to backup your iOS device because you may find some bugs in beta versions. If you find any such bugs, you can contact Apple feedback service on the beta via its Feedback Assistant.